Peru is known mostly for its ceviche peruano – a dish made of the freshest fish marinated with wonderful ingredients. This country is considered one of the most important culinary destinations in Latin America. Its gastronomy has influences from almost every continent! It is this international fusion combined with the Inca culture, and the fact that it has one of the world’s most diverse crops, that make Peru so interesting for the palate. Serve up this recipe and show off your Peruvian pride when you get together with friends and family to watch the Big Torneo this month. Find more tips on how to celebrate fútbol from head to toe at Orgullosa. Want more recipes? Check out all the yummy things at Hispanic Kitchen. Cut the white fish in half-inch cubes. Place them in a bowl and add the onions. Place in the fridge until you are ready to serve the dish. 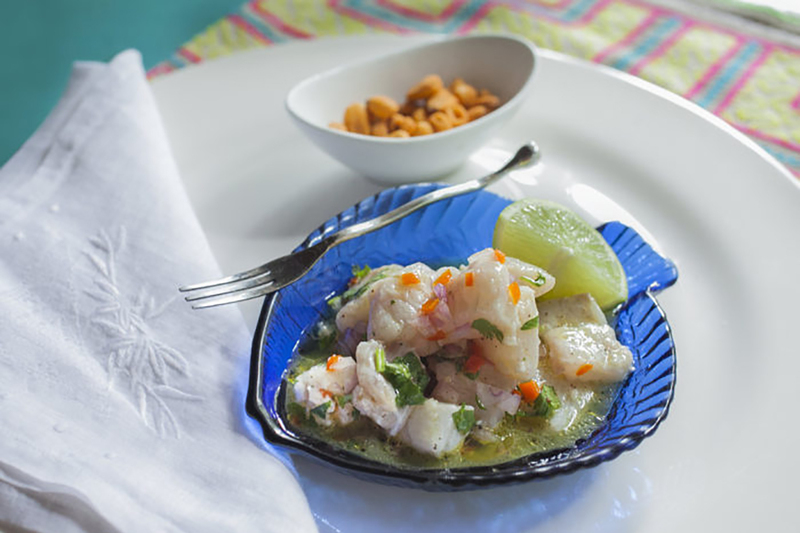 Once you are ready to serve the ceviche, add the lime juice, salt and ají limo. Add the olive oil last. Stir in the rest of the ingredients. Leave the mixture resting for 2 minutes, which is how long it takes for the lime juice to cook the raw fish.